Twins Geek: It’s not a matter of if, but when. Over the past few years, the Twins have timed contract extensions for two times of the offseason. For batters (ex. Justin Morneau, Michael Cuddyer, Torii Hunter), they’ve announced them in late January, usually just before Twinsfest. For pitchers, they’ve finished them early in spring training, once they’re comfortable that the pitchers arm is healthy. So it’s probably fair to say that the Twins wanted this deal done by now. And Mauer certainly wanted a deal done by spring training. If something happens this spring – he twists a knee, he has his sacroiliac joint flare up, he wakes up with glaucoma – that’s his problem. The Twins don’t share that risk. The only big incentive for Mauer to sign a deal this offseason, as opposed to next offseason, was that it removed the risk of him being injured or having a bad year. That advantage is slowly disappearing. So, if both sides wanted to get a dead done by now, and it isn’t done, why isn’t it? Maybe there's a disagreement big enough that both sides would let their timeline slip? TG: Maybe, but deals like this are complicated. They take some time. A deal like this is done every year. We’ve seen them for Matt Holliday, Mark Teixera, and CC Sabathia over the last year-and-a-half. Those are seven to ten years, with a slightly escalating yearly salary, a no-trade clause and an opt-out year to protect the player from inflation. One could even argue that Mauer’s upcoming contract would slot very nicely between Teixera’s nine-year deal from last offseason and Alex Rodriguez’s 10-year deal from the year before. I’d hazard a guess that Mauer’s agent, Ron Shapiro, can fairly accurately predict the offer he’s likely to get next year from the Yankees right now. TG: But Shapiro was the agent for Kirby Puckett and Cal Ripken Jr. They stayed with their teams. GC: Yes, of course. That’s what everyone says. So let’s talk about who else Shapiro has represented. He represented Eddie Murray, a Baltimore Orioles institution until he left for the Dodgers. He represented Sean Casey, a Cincinnati Red fan favorite until he was traded to the Pirates and played for the Tigers and Red Sox. And he represented Trot Nixon, a gritty hard-nosed Red Sox who ended his career playing for Cleveland and the Mets. TG: But those guys weren’t in Joe’s position. Their careers were winding down. And Mauer's from here. He’ll certainly take a discount to stay with his hometown team. GC: Yes, of course. That’s what everyone says. So let’s talk about the discounts he’s taken so far. In 2007, when he signed his last extension (in early February, by the way), the Twins didn’t save much money either. He was paid $20.5 million for his three years of arbitration, similar to what a premium player would expect to make those years. Instead, the Twins were rewarded with a buyout of his first free agency year (this year) for $12.5 million. Mauer may not have squeezed every last nickel out of the Twins, but there is precious little evidence that he’s given any generous discounts in past negotiations. TG: But the Twins HAVE to sign him. They can’t lose the face of the franchise. Minnesotans would storm Target Field with pitchforks and torches if they don’t! GC: Yes, of course. That’s what everyone says. Let’s talk about losing a face of the franchise. See if this sounds familiar. A successful team opens a brand-new downtown ballpark to replace their sterile dome. The face of their franchise was soon to be a free agent and they knew they would need to dig deep and offer a record-setting deal to keep him. But it would get done. Nobody could imagine the Mariners without Ken Griffey Jr. The Mariners offered that record-setting deal, and Griffey turned it down. He had been friends with pro golfer Payne Stewart, who died in a bizarre plane crash. The pilot and passengers had lost consciousness during the flight due to oxygen deficiency when the plane lost pressurization. The plane eventually ran out of fuel and crashed near Mina, South Dakota. The tragedy impacted Griffey deeply. The good news? Safeco wasn’t burned to the ground. And the money was channeled into other players. The Mariners, who had averaged 81 wins in Griffey’s last four years with the team, averaged 98(!) wins in the four years after he left. Without Griffey, the Mariners made it to the American League Championship Series in 2000 and 2001. TG: But that’s not going to happen. It’s inconceivable that Mauer doesn’t sign. It’s not a matter of if, but when, right? Right? GC: Yes. Of course. That’s what everyone says. Chicago's field is a hitter-friendly park, which is why they had all those teams with big sluggers. The Twins on the otherhand, played in the Dome with artificial turf, which was a good fit for the small ball type of game. Now the Twins are outdoors and that small ball approach will not work as well on real grass, with no baseball-colored roof to punish opposing fielders. It's no surprise the Twins' line-up is different. If the Sox are in fact moving toward the small ball game, it wouldn't seem very smart, considering the park they play in. It’s an interesting point, and there is certainly evidence that the Twins tailored their (left-handed heavy) lineup to match the dome. And there’s evidence that they tailored Target Field to match their lineup. It’ll be neat to see if Target Field surprises everyone. 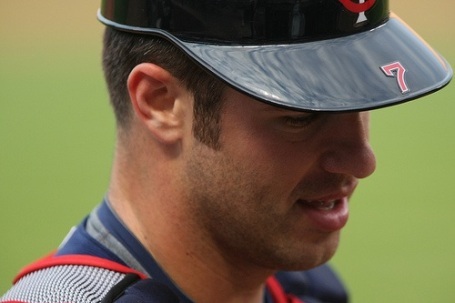 Parker explains how similar statistics mask very different truths about Mauer and Thome. And Aaron Gleeman pointed out this great (and long) interview with Howard Norsetter, who is the international scouting coordinator for the Twins in Europe, Australia and Asia. Finally, if you find some Twins links (news or opinions) you think are worthwhile email to them through my site and maybe I’ll be able to include them in some links. I rarely have time to search and find all the Twins links out there, but when I have time I'll stop by if someone tells me about them. Thanks.